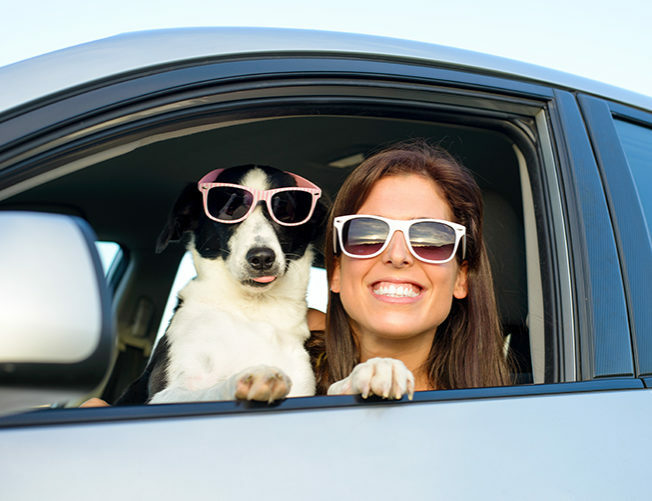 Traveling with your pets can be a fun endeavor, especially with the rising popularity of pet-friendly restaurants and hotels. But, much like packing up the kids to go on vacation, there are a few specific details you need to iron out before you go. And if you’re on a road trip, always have a container of drinking water with you! When traveling with your pet, you might encounter animal health requirements specific to your destination. As soon as you know your travel details, it’s important to contact your veterinarian to assist with the pet travel process. Factors to consider may include meeting time frames for obtaining a health certificate, updating vaccinations, diagnostic testing, or administration of medications/ treatments. Regulations for traveling in the U.S. are not stringent; however, it’s always a good idea to have your pet’s health records on-hand. Traveling with your pet to a foreign country, however, can be a little…hairy! For example, if you plan to travel to Australia with your pup, you must follow 20 steps before the government will permit entry! You definitely don’t want to wait until the last minute. Some airlines allow small pets to travel in the cabin with you as your carry-on item while others require pets to travel in the cargo area below. BringFido has an excellent list detailing regulations and fees for most major airlines. Use a carrier that is approved by your airline. Have your pet’s vaccinations updated before you leave. Ensure your pet is microchipped in the event he’s lost. When you take a car trip with your cat or dog, the Humane Society recommends that each (especially cats who are more prone to wandering) be crated. They also say that dog restraints or seat belts are useful for preventing your dog from roaming around the car and being a distraction; however, they haven’t reliably been shown to protect dogs in the event of a crash. Be sure to also stop for plenty of bathroom and exercise breaks, but always keep a collar and tags on your dog just in case he gets loose. It’s always best when traveling with pets to have another two-legged traveler so one of you can stay in the vehicle if you need to take a rest stop. If you’re solo, make it quick and leave windows open in warm weather. And, before you go, be sure to search the internet for pet friendly places that welcome your animals. Most places in the U.S. that are pet friendly only welcome dogs, so search for “dog friendly restaurant” and the city you’re visiting. Most of all, have a great time and fun adventures with your pets!